The Restoration of Otto Laird by Nigel Packer was ordered from our wholesaler because this tale of an elderly architect whose most notable building, a 1960s tower block, is about to be demolished. Otto returns to London to try to save his building and in the process revisits his past and considers his future. Architecture is the family business for The Husband – he’s the exception – and his father is responsible for many similar tower blocks plus I have a master’s degree in housing policy and have a soft spot for mid-century architecture. What we all make of this novel will be interesting. Drop City by T C Boyle was recommended by my friend Vikki Reilly who works for Birlinn, a fantastic Edinburgh publisher. He’s an author I’ve never really got into but she loves this book and it’s set in a 1970s Californian commune and we’re off to San Francisco this summer so I thought it might make interesting plane reading, together with Tales of the City by the incomparable Armistead Maupin which I love and haven’t read for years. Is it weird to have organised your reading for the plane before you’ve booked the plane tickets? 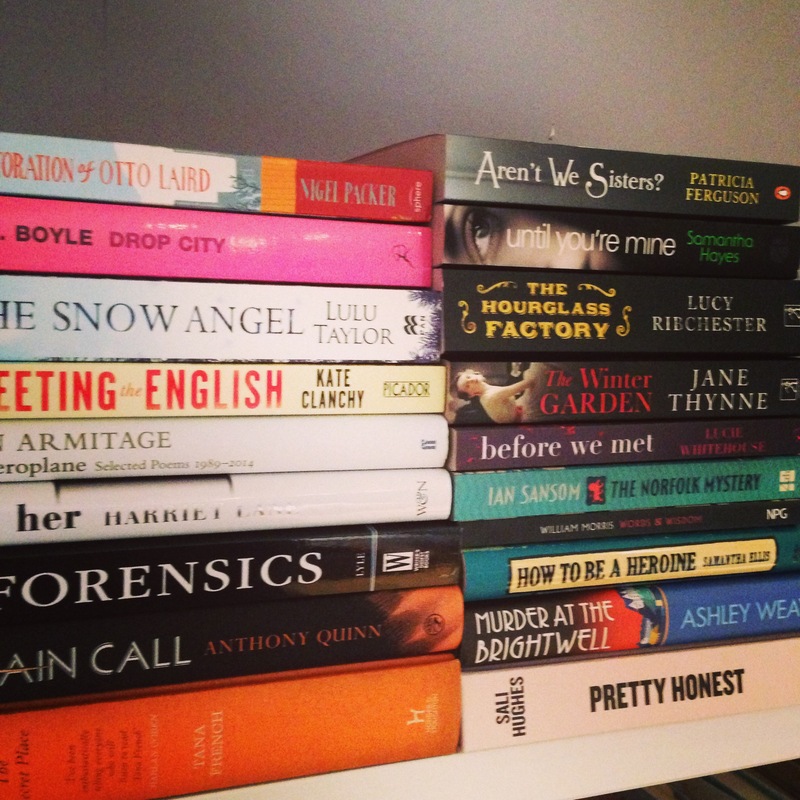 After those two which are top of the to-be-read pile, next come a handful of novels that have caught my eye recently. Aren’t We Sisters? by Patricia Ferguson is a crime novel, praised by Amanda Craig whose opinion I have the greatest respect for; Samantha Hayes’ Until You’re Mine is a psychological thriller that looks perfect for a dark winter evening; The Winter Garden by Jane Thynne is set in 1937 Berlin and set among society figures such as the recently abdicated Edward VIII and the Mitford sisters so it was irrestible; Meeting the English by Kate Clanchy looks interesting – fading literary star, crumbling house in Hampstead and a newcomer from Scotland; I know nothing about Before We Met by Lucie Waterhouse but I loved her debut, The House At Midnight so that was enough for me to pick this title up; The Snow Angel by Lulu Taylor (please Lulu, update your website) a time-slip novel set in Cumbria and features a mysterious visitor and an unexpected legacy and I’m looking forward to it; Her by Harriet Lane is “chilling revenge noir” and should be a good read, and finally, The Secret Place by Tana French should be a treat as I particularly enjoyed her last novel Broken Harbour. Other novels in the pile are The Norfolk Mystery by Ian Sansom which apparently celebrates and “sends up the golden age detective novels when, in the Thirties, Dorothy L Sayers and Agatha Christie were the queens of crime.” That was enough to catch my attention and I’ll let you know if the celebrating and sending up works or not. In a similar retro-Golden Age vein is Murder at the Brightwell by Ashley Weaver. I’ve heard good and not-so-good things about this but as someone writing a crime novel set in the 1920s I reckon it’s good to be aware of what else is happening in the genre. That the author is American and has set this in England worries me a little because that so often doesn’t work. Fingers crossed though. I also picked up Curtain Call by Anthony Quinn – it seems that 1930s murder mysteries are my current genre of choice – although having heard it on Radio 4 I’m not sure when I’ll get round to reading it so it will probably be read first by my mother-in-law. The last of the recent fiction acquisitions is The Hourglass Factory by Lucy Ribchester which came out this month. Ribchester is an Edinburgh author and so it would be lovely to have another local writer to praise – I was sent this by her publisher although sadly I didn’t manage to make it to the launch last week. That’s it for novels. The rest of the pile comprises How To Be A Heroine by Samantha Ellis, subtitled ‘Or, what I’ve learned from reading too much‘; a collection of Words and Wisdom by William Morris that I picked up at the National Gallery; Pretty Honest by Sali Hughes looked interesting but frankly, a quite flick through has shown that even to a skincare junkie like me there’s nothing new there that a hundred other people haven’t already written about on the web. And she’d also be horrified that I have been known to nip out to the supermarket with damp hair and no slap. Probably destined for the charity shop box pretty soon… I also picked up a signed copy of Simon Armitage’s new poetry collection, Paper Aeroplanes, in Foyles which I’ll keep by the bed to dip into. Finally, the most random and yet probably the book which will contribute the most to my life, is D P Lyle’s Forensics; A Guide For Writers which attemps to explain the intricacies of DNA, fingerprinting and the like in an accessible form. Given that I’ve just lobbed the poor victim of my novel off a bridge, this is going to be invaluable at making sure that I don’t make any glaring errors in terms of post-mortem bruising and drowning. It was a Christmas present – I love a useful gift! What are your recent book arrivals that you’re looking forward to getting stuck into? This entry was posted in Reading and tagged books about books, crime fiction, fiction, non-fiction, poetry, recent literary acquisitions, writing. Bookmark the permalink.